Rhino Hero on his comfortable perch, just a few floors up from the ground. Poor Rhino Hero. He just wants to save the day. Yet while he is able to scale buildings with ease, his enormous girth is often more of a liability than an aid to the lawful citizens he is trying to protect. With Rhino Hero around, the building is safe from burglars–but will it be safe from toppling? 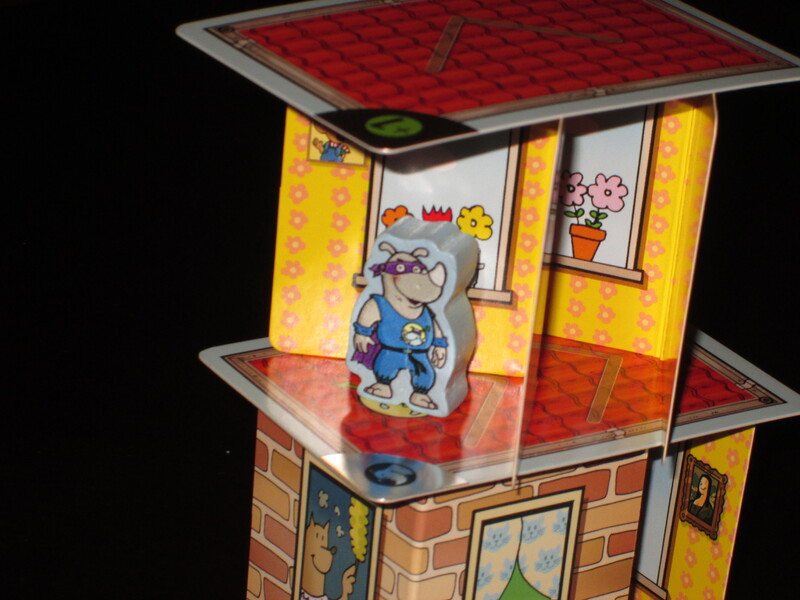 Rhino Hero is a dexterity stacking game for two to five players. 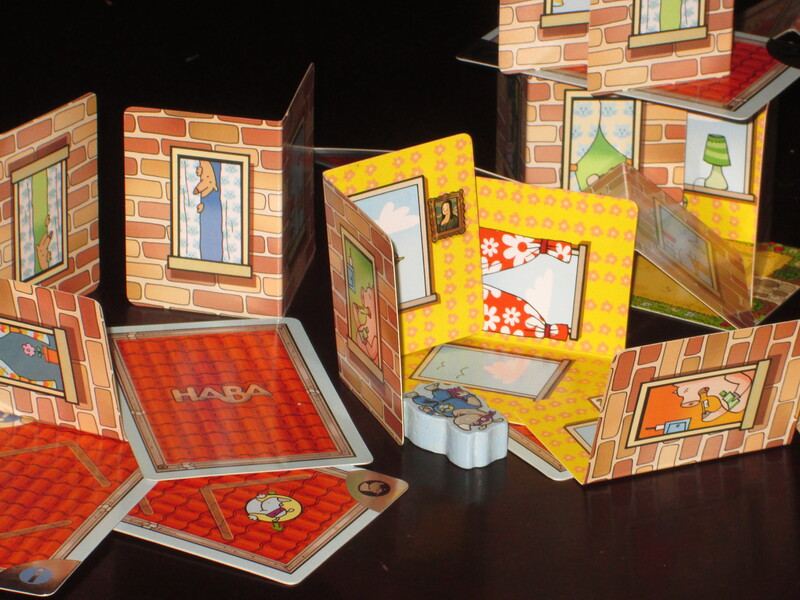 Players place walls and play roof cards. The first player to empty his or her hand or the player with the fewest roof cards in hand when the building topples wins. To begin, each player is dealt a hand of five roof cards. Players decide whether to play normal or advanced mode (that is, whether the foundation will be stable or slightly unstable), and play begins. The roof cards in Rhino Hero. Most roof cards have a special power, and all of them show how the next player must place the walls. 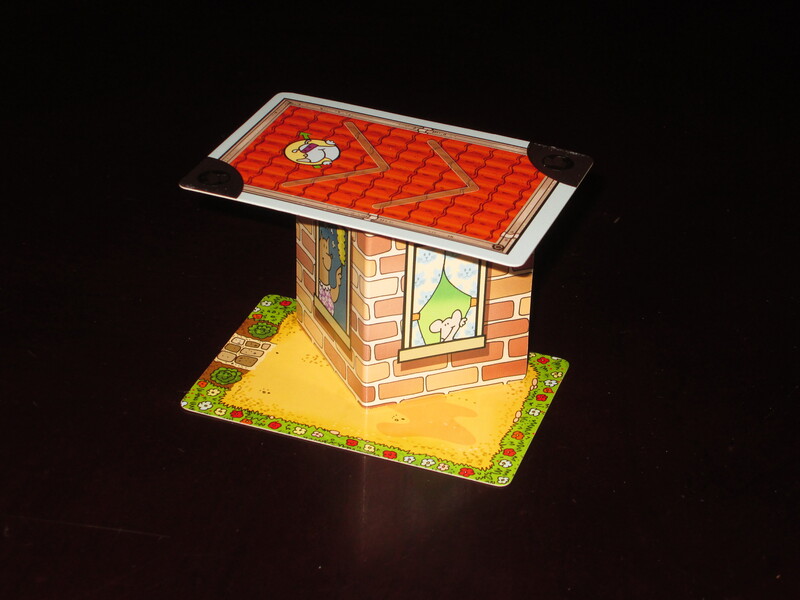 On a turn, players must place wall cards as shown on the previous roof card and then place one of the roof cards from their hand on top of the walls. 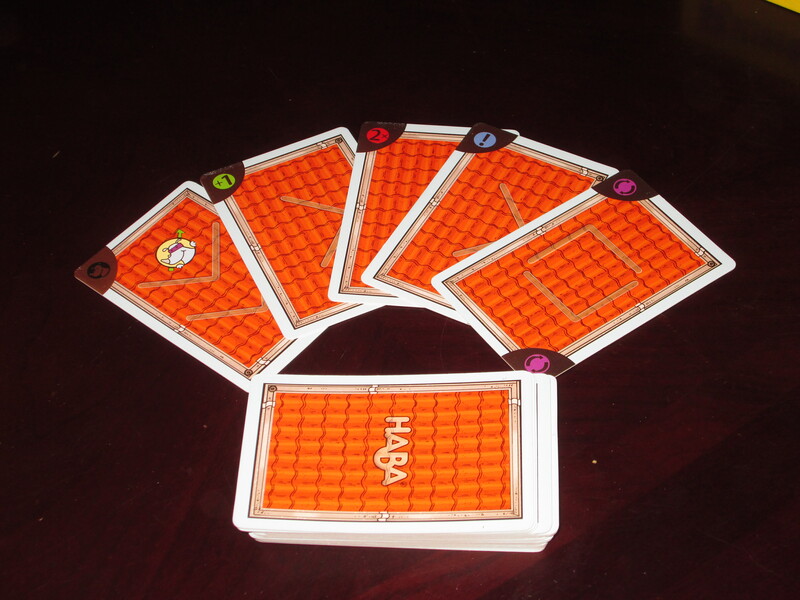 Some roof cards have special powers like making the next player draw a card, skipping the next player’s turn, reversing the order of play, or allowing the person who played it to play another roof card. But the most common symbol on roof cards is the Rhino Hero symbol. When the Rhino Hero symbol is on a roof card, the next player must move the wooden Rhino Hero pawn from wherever it is in the building to the new roof card. Play continues until one player’s hand is depleted or the tower falls over. If the former, that player wins. If the latter, the player with the fewest roof cards in hand (who did not topple the tower) wins. The game usually ends in a toppled mess. Poor Rhino Hero lies among the debris. Rhino Hero, or Rhino Zero? 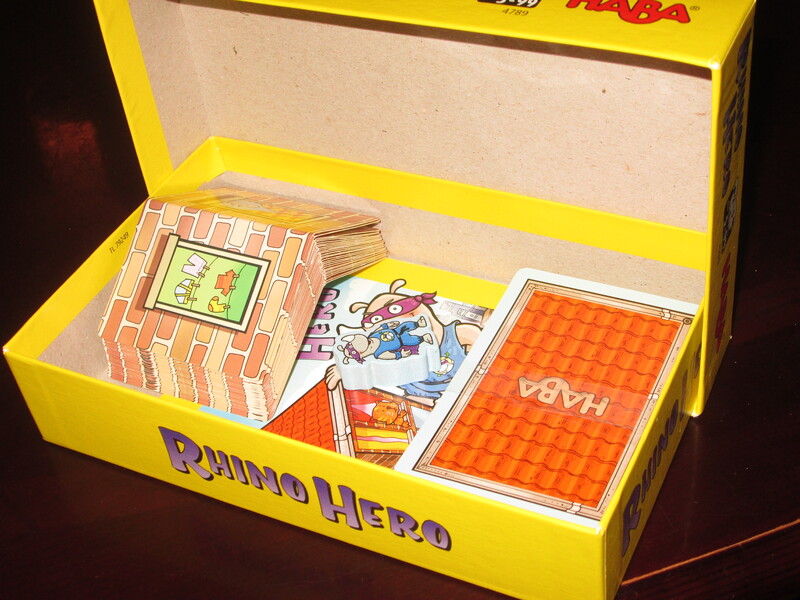 Rhino Hero is a dexterity game designed for children, and it is very fun for the target audience. It’s also a lot of fun for adults. That Rhino Hero can be played by children is one of its great strengths. The cards are easy to manipulate, the roof powers are easy to understand (especially if the child has already played Uno), and moving the Rhino Hero pawn might actually be easier for little hands than for older players with sausage fingers (…). My nieces and nephews enjoy building the tower as high as it will go. And even my three-year-old son, who doesn’t quite grasp the concept of the game, enjoys at least practicing his Big Bad Wolf skills in blowing down the precarious structure his father has built. Of course, that Rhino Hero can be played by children is also one of its greatest weaknesses, at least for adult-only groups. There is a lot of luck involved, and some card abilities are strictly better at helping players empty their hands (for example, the roofs that allow a player to place a second card). A “good” player can be hampered by roofs that force him or her to draw a card or lose a turn. These tactics, which help eliminate the skill gap in a mixed game of adults and children, are unfair in a competitive setting where players are of near-equal skill. Similarly, there is little decision involved in how to place walls. There are guide marks on each roof card, and players are required to stick as closely to these as possible. 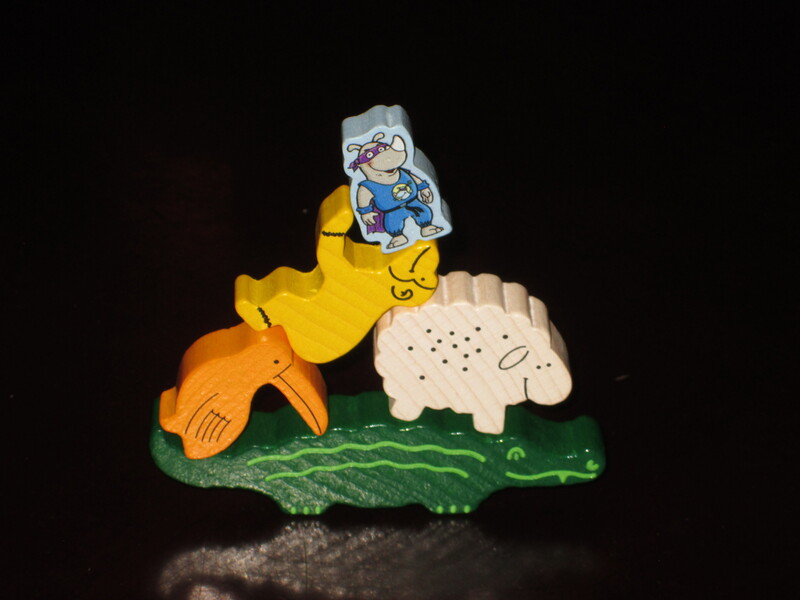 Even Animal upon Animal–another Haba dexterity game–requires more skill in exploiting the different balancing points of animals on their perches. And yet, despite this, I said that Rhino Hero is a lot of fun for adults. Where does the fun come in? Well, while Rhino Hero does not always succeed as a competitive game for adults, it is an excellent activity. There are a few things that make Rhino Hero stay in my collection despite a crowded dexterity game field: accessibility, portability, and charm. First, accessibility. Rhino Hero is super easy to explain. I did have one experience where the explanation took longer than it should have, but as soon as I told the player who was asking esoteric strategy questions, “You’re really overthinking this,” we all jumped right in and realized just how simple the game is. What makes this game such a blast to play with children is what makes it easy to break out with any group. I can play with people who are primarily strategy gamers (and ask esoteric strategy questions) and with a more casual crowd, and there’s usually something for everyone: laughter. Because this game produces a lot of laughs, especially when you have to make the heavy Rhino Hero scale the building. While the dexterity genre isn’t necessarily known for its rule tomes, Rhino Hero takes simplicity to a new level. Because most people are familiar with building card houses, the premise of the game is immediately understandable. The rules facilitate an already familiar activity. And because most of us (at least those of us with shaky hands) know that card houses are notoriously unsteady, it immediately sets a low bar for expectations of how seriously the game should be taken. The game box is small, so Rhino Hero is quite portable. Second, Rhino Hero stays in my collection because it is very portable. I like Crokinole, but I barely play the game in my own house because it’s such a hassle to drag to the table. Villa Paletti (a recent find that I enjoy quite a bit) comes in a big box–it takes up a lot of real estate in my game bag for what is essentially an icebreaking game. Dexterity games usually aren’t the focal point of any game night, yet many of them, because they are so reliant on their components, take up space like they are. This is where Rhino Hero is so handy. It’s very easy to throw into my game bag as an afterthought or to cram into the leftover spaces once I’ve chosen the main courses to bring. While Rhino Hero isn’t my favorite dexterity game, it sees a lot of play simply because it’s easy to bring everywhere. But really, the thing that makes Rhino Hero stick around is its charm. The game looks great, and the components are perfect. The cards that form the walls of the building are illustrated on both sides, and it’s fun to look at the building as it’s built. The Rhino Hero pawn is outstanding. It’s small (and thus hard to manipulate) and just heavy enough to throw off the balance of an already teetering structure. It is always thrilling to have to move it (or to watch another player move it) because even on lower levels of the building it’s possible to knock the whole thing over. It doesn’t seem like moving the Rhino Hero should take much effort, but it is surprisingly hard to do, especially as the tower grows. 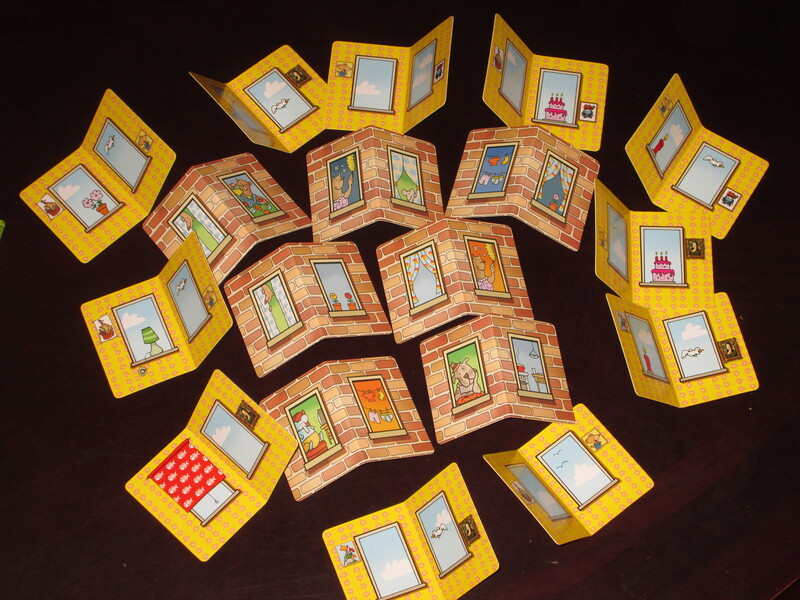 The wall cards in Rhino Hero. These are double sided, showing inside and outside the apartments. Charming, charming, charming. Beyond these charming elements, there is a certain X factor that playing the game brings out. For whatever reason, there is always a lot of energy around the table when we play. Players get into it, similar to how when Wii Sports was first released, players of all ages would gather round the TV screen and trash talk about bowling. Bowling is an activity almost relegated to league play these days where I live (as any visit to a bowling alley will inevitably reveal to you), and most families have moved on. Yet there was something special about gathering around the TV, using a strange tool, and “bowling” again when the Wii was first released. That’s the closest parallel I can think of to why Rhino Hero works as well as it does. A familiar childhood activity is given a new “tool,” and it is completely born anew. There is new life, and people are thrilled to be a part of it. 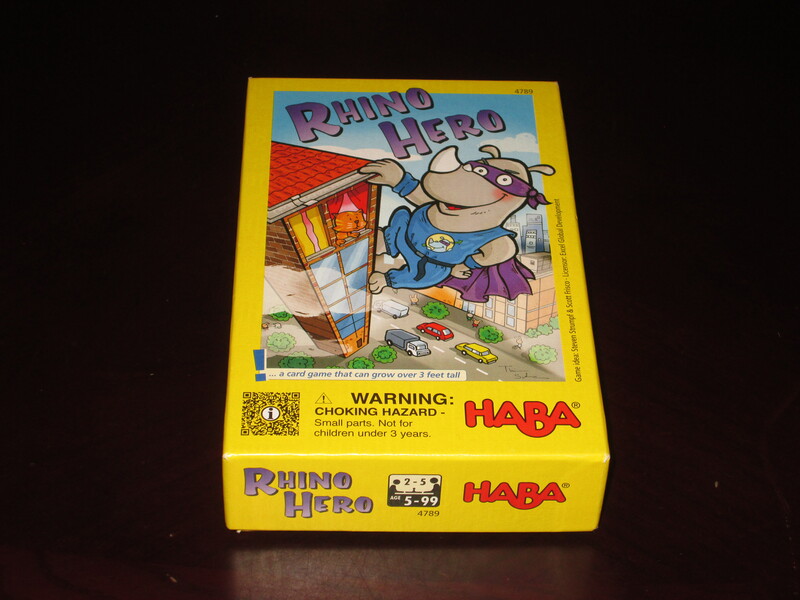 There’s also the consideration that despite the small package, Rhino Hero has a big presence on the table. Because the game is built up, it naturally attracts attention when it is being played. Others come over to watch and comment, which contributes to the energy at the table. The bottom floor card is double-sided, allowing for a more stable standard game and a more precarious advanced game. The game usually ends with emptied hands in the standard game and with a tower collapse in the advanced game. Both are fun. Rhino Hero can be played with two to five players, and it’s good at all of these counts. In the two-player game, obviously, you will have more opportunities to play; with the five-player game, there is more energy around the table. I’ve even played with six players (we made the cards that force players to draw cards rhino cards instead), and it worked fine. Rhino Hero, despite being a children’s game, is fun for adults too. Despite its emphasis on luck rather than the skill required in more complex dexterity games, Rhino Hero remains one of my most requested dexterity games, largely because of its charm and the energy it brings to the table. It is a worthy choice for most game collections and game night bags.